Dave is all healed ready for adoption! Look how fabulous his eye looks now. He's quite a handsome and sweet,little boy. 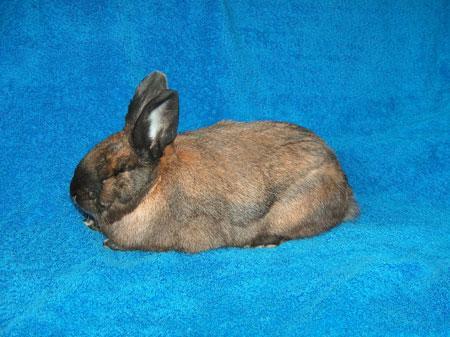 Dave is available for general adoption and we don't consider him a special needs rabbit. He has adapted to only having one eye and gets around very well. Consistency is important to most rabbits, especially one like Dave with one eye, who may not be able to see or navigate quite as well as other rabbits. So,the best home for Dave is a peaceful home with people who can offer a regular routine in a mostly cage-free, bunny- safe room or home. P.S. Dave's surgery was several hundred dollars, so we are still seeking donations to help cover his care, as well as charging an adoption of $150 to adopt Dave. This will help us raise funds to help other rabbits in need. You will absolutely LOVE Dave. He's a sweet and loving boy. Dave, formerly Nutmeg, came through his eye removal surgery (enuculeation) very well and is healing nicely. Dave is a sweet and gentle bunny with so much love to share. We were all rooting for him to have an uneventful surgery and speedy recovery. We love this guy! It will be hard to part with him when he is adopted, but he will definitely make someone a devoted and loving companion rabbit. Thank you to everyone who cared about Dave and offered support and help. Your help and interest is the only way we can rescue special needs rabbits like Dave and give them the care they need. Some bunnies are just luckier than others and you could say that I've had both better and worse luck than many other rabbits. I came to SaveABunny from the San Jose shelter after being placed on the euthanasia list for medical reasons. I was truly a last minute rescue, because there is so much overcrowding at shelters,and such a demand on rescue help, that SaveABunny had to make special arrangements to take me. Initially, there was no space for me in rescue, which meant that I was scheduled to be put down at the San Jose shelter. However, thanks to a kind volunteer,a foster home was found for another rabbit at SaveABunny, so that I could take his place and get the care I urgently need. Foster homes are always urgently needed, so if you can help, please contact SaveABunny ASAP through this website. One of my eyes is missing and no one is sure if I was born this way, or if something happened to me in my short life. Since I am very active and navigate quite well with only one eye, it is likely that I have been this way for a while. Despite my eye condition, I am a truly mellow, sweet and very loving rabbit. I'm also quite a handsome boy. The reason that I am listed as a special needs rabbit is not that I only have one eye, because that in itself is not a big deal. It's that I need to have eye surgery, called "enucleation" to clean out my eye socket area and make sure that I don't have an infection. This surgery, along with my neuter will cost SaveABunny about $500-$600, and so I am considered special needs, because of the need for surgery. My adoption fee will be higher (sliding scale)to help offset costs. SaveABunny is very often the only rabbit rescue organization in the San Francisco Bay area that accepts injured or special needs rabbits, like me. Since SaveABunny relies on donations, adoption fees and revenue from ebay and Cafepress stores,I really hope you will support them by making a donation or shopping online though iGive, SaveABunny's ebay and cafepress stores. You can make an online donation via Paypal at Donate via Paypal They take a 5% fee, but it is convenient. Or you can mail a check to SaveABunny, 514 Pineo Avenue, Mill Valley, CA 94942. Your can donate with the peace of mind that your donation is being used directly to help animals. Thank you so much for caring about me and please check back in to learn how my surgery worked out.